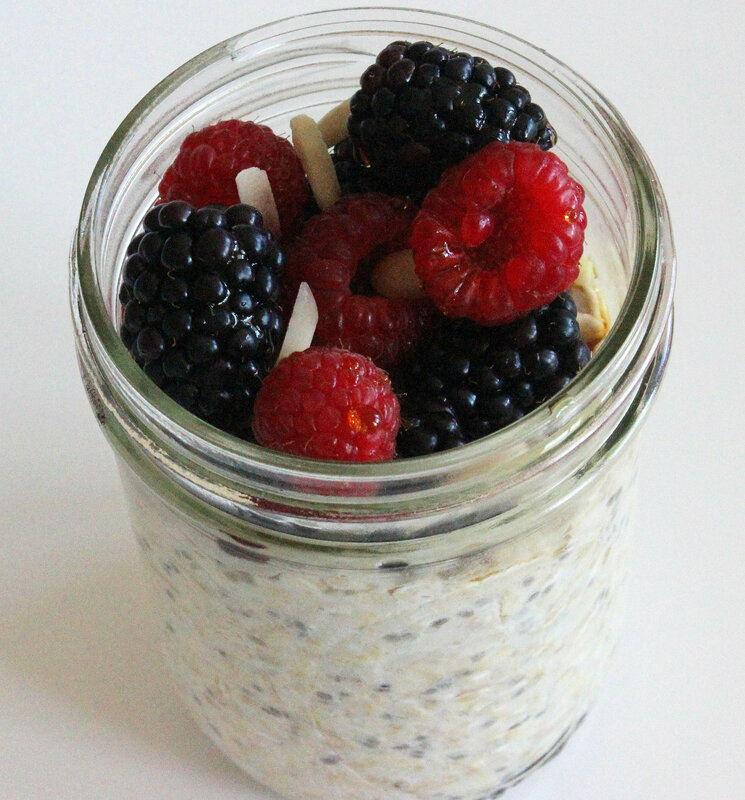 Overnight Oats= The Easiest Weight- Loss Breakfast EVER! I always go to bed with the best intentions to wake up early, enjoy the morning, and fuel my body with a satisfying breakfast, but things don’t always work out that way — did I mention I’m not much of a morning person? Luckily, I’ve found a recipe that requires about 30 seconds of preparation the night before and ensures that I get to fulfill at least one of these morning goals every day. Meet the easiest breakfast of all time: overnight oats. It does not get any better than mixing a few ingredients together before bed and grabbing a spoon when you’re ready to eat a delicious breakfast. High in protein and fiber, this whole-grain recipe will keep hunger at bay all morning long. Even better, this recipe supports healthy digestion and can even help you beat belly bloat. I’ve toyed around with a number of iterations of the basic recipe with slight changes, but this combination of ingredients including chia seeds and slivered almonds has become my go-to mix. Try it out for yourself tonight. Mix all the ingredients together in a glass jar. Stir well, cover, and refrigerate overnight. The next morning, remove from the fridge, top off with your favorite fresh fruit, and enjoy!